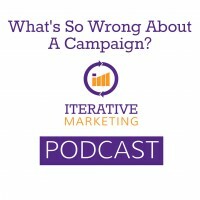 What’s So Wrong About a Campaign? Campaigns are big ideas constrained to a specific time period. A program is the intersection of a defined objective for a defined audience with no definitive end date. Campaigns use a pre-determined timeframe, either running creative long past its effectiveness or stopping too early. Programs plan for creative changes when needed and are responsive to market engagement. Lessons learned from the last campaign are often thrown away because they are not applicable to the next one. Programs allow you to build up knowledge over time based on what messaging works best and what media channels deliver most efficiently. We hope you want to join us on our journey. Find us on IterativeMarketing.net, the hub for the methodology and community. Email us at podcas[email protected], follow us on twitter at @iter8ive or join The Iterative Marketing Community LinkedIn group.